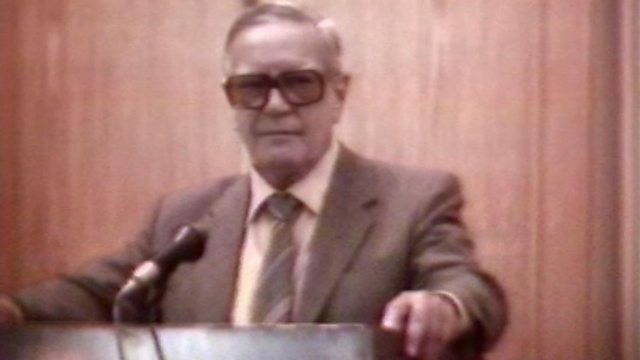 How did notorious traitor Kim Philby manage to infiltrate MI6 and send its most sensitive secrets to the Soviets? Now, for the first time, his account in a once-secret tape. How did notorious traitor Kim Philby manage to infiltrate MI6 and send its most sensitive secrets to the Soviets? Now, for the first time, we can hear his account in a once secret tape the BBC has unearthed. It is a story of documents smuggled, Cold War operations betrayed, and Philby's ability to evade detection by simply denying everything. BBC Security Correspondent Gordon Corera reveals the full story. Photo with kind permission from BStU (Federal Commissioner for Stasi Records).